I am the wanderer called Dudjom Jigdral Yeshe Dorje. I was born in the hidden land of Pema Kö in the Wood Dragon year of the fifteenth rabjung (1904). My father, Khengla Jampal Norbu Wangyal, was descended from the royal family of Kanam. 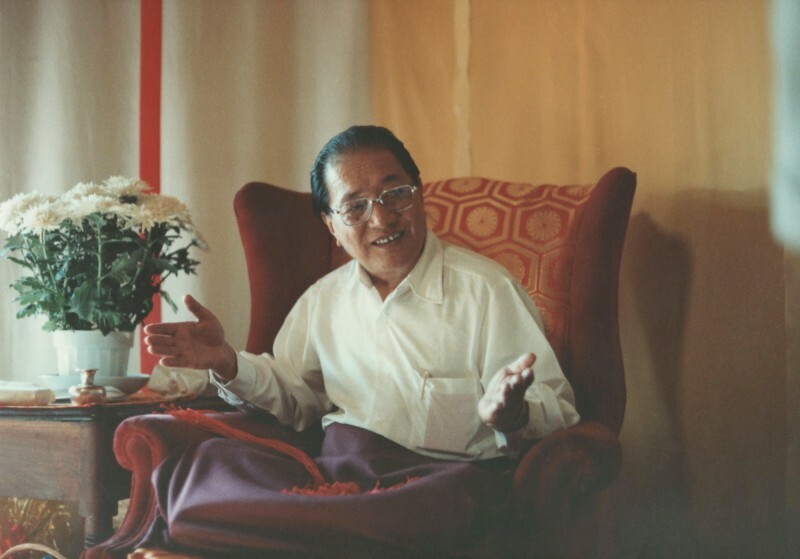 At about the age of three, I was recognized as the incarnation of the great treasure revealer Dudjom. His disciples took me in, and so I entered the gate of dharma. My tutors, knowing that the foundation of knowledge is reading and writing, set me on a course of constant study and ensured that I memorized the daily prayers and rituals. They educated me in physical, verbal, and mental conduct so as always to avoid wrongdoing and behave correctly. They employed history, stories, elementary principles, and the like, so that with these various methods of teaching, my eye of wisdom opened a little. As I grew in years and wisdom, accordingly a succession of learned and realized masters looked after me with their love and compassion. Grammar, poetry, astrology, medicine, and the other ordinary sciences I picked up in bits and pieces. As for the extraordinary sciences I studied just a few scriptures on the middle way, the teachings of Maitreya, A Guide to the Bodhisattva’s Way of Life, and teachings on the three vows. In particular, it was the ripening empowerments, liberating instructions, tantric commentaries, profound pith instructions, and so on from the ocean of kama and terma of the Nyingma tradition of mantrayana with which I was chiefly concerned. Beginning with the thirteen great activities of a vajracharya, which include the performance of rituals, torma making, decorative arts, dance, drawing, chanting, and music related to various classes of practice, I applied myself assiduously to learning the tradition of the lineage of the vidyadharas without neglecting anything. At times, I devoted myself to practice, first the accumulation and purification of the ngöndro practice, and then the main practice of the creation and completion stages, with the phases of approach and accomplishment, and I did my best, diligently accumulating ounces into pounds. But, unfortunately, thanks to my having the title of “lama,” all I really did was to serve as the slave of distraction posing as “benefiting the teachings” and “helping beings.” The result was that in the end the realization and qualities I gained from practice were as copious as the hair on a tortoise. Whatever nectar of dharma I received, and whatever I learned, I taught and spread as much as I could to people everywhere, according to what they required. Even though I’m not a member of the illustrious club of scholars, in order not to refuse people’s demands, and in the hope that it might be of some small service to the teachings, I wrote History of the Nyingma School of Tibetan Buddhism, Fundamentals of the Nyingma School of Tibetan Buddhism, History of Tibet, commentaries on Definitive Distinctions among the Three Vows, practice instruction manuals for the many cycles of sadhanas, pith retreat instructions, and other works. They are being compiled and edited—more than twenty volumes have already been published—and these I leave as the achievement of my learning, set down in writing without any expectation or fear.